Provide comfort for the family of Marcella Nappi with a meaningful gesture of sympathy. Marcella Mae “Cella” Nappi (Benjamin) passed away peacefully on February 5th, 2019 in Charles Town, WVA at the age of 63. Marcella is survived by her mother Lucille Benjamin of Lynchburg, South Carolina; husband, Pete Nappi; children, Krystina Nicole Nappi and Peter Mikael Nappi; grandchildren; Peter Alexander, Robert James (RJ), siblings, Frank, Dwight, Andre and David Benjamin and numerous nieces and nephews. She is preceded in death by her father Frank Benjamin Sr. (2003) and sister Camilla Newman (2011). Marcella was born on December 23, 1955 in Washington, DC to Lucille and Frank Benjamin Sr. She graduated from Cardoza High School in 1974 with a General High School Diploma. She married Pete Nappi in September of 1986 and they moved to Loudoun County, Virginia. Marcella’s first priority was raising her children. She ensured that they had a balance of fun, education and were taught proper manners. She also made sure that God was in their lives. Every Sunday they went to the 15th Street Presbyterian Church in Washington DC. Every Tuesday, they were with her at choir practice. She began working for Loudoun County Public Schools first as a volunteer, a substitute, then full time at Simpson Middle School as a secretary to the 8th grade. She was later recruited to assist with the opening of a new high school, Tuscarora in Leesburg in 2010, where she worked until December 2018. Marcella had a God given voice and was an accomplished singer. In the spring and fall seasons, with the windows open, you could her strong soulful voice singing throughout the neighborhood. Her enjoyment was singing gospel music with the church choir and later trained in classical music. She enjoyed and listened to also all genres of music, but she especially liked her KPop and Barry Manilow music. One could hear her late at night listening and singing to the MNET channel. She also participated in several school plays when time permitted. “Mama Nappi”, as she was called throughout the Leesburg neighborhoods, was a generous and caring person. When you met her for the first time, one would walk away thinking you had known her all your life. She had an infectious smile and could fill up a room with laughter. She had a unique gift of making everyone feel that they were special and mattered. She was passionate about her family, friends and especially loved her grandkids: Peter Alexander and Robert James (RJ). The Lord must have needed a special angel when he called her home. Marcella (“Cella”) will be truly missed, but we take comfort in the assuredness that she is watching over us… making sure each of us passes the seeds that she planted. To send flowers to the family of Marcella Mae Nappi, please visit our Heartfelt Sympathies Store. Donations are being accepted for: HOSPICE OF THE PANHANDLE INC.
We encourage you to share any memorable photos or stories about Marcella. All tributes placed on and purchased through this memorial website will remain on in perpetuity for generations. Gallegos Family sent flowers to the family of Marcella Mae Nappi. Peter and family, Marcella was a wonderful person, I will never forget her smile, the way she laughed and her beautiful voice. Heaven has another Angel. 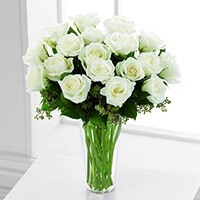 Gallegos Family purchased the The FTD White Rose Bouquet for the family of Marcella Nappi.